Ian MacDonald, Lynsey Archer, Steve Dellow, Liz Holding, Marije Tunnicliffe and John Carder. Much appreciated! Seb sends in "1s lose 5-1 to top of the league Rugby. Scoreline doesn't reflect the effort and performance but small margins and Rugby's better finishing made the difference." Balfs writes "2s perform well but marginally lose 2-1 to second in league Edgbaston. Still in solid league position with 3 matches to go". Langers reports "Nice 4-1 win against a side that defended deep and their keeper pulled off a string of top class saves. 2 for JK and 1 each for Bakes and Shep did the damage for us. Matt Walmsley earned POTM. We arrived 30 mins too early (sorry guys I got that wrong) but Will Walker entertained us with fun facts about his new combine harvester! Check out his photos of the new acquisition below!!!" A somewhat relieved Nick writes "Sawdon's 4 fires the 4s to another much needed 3 points earning him MotM in the process!" 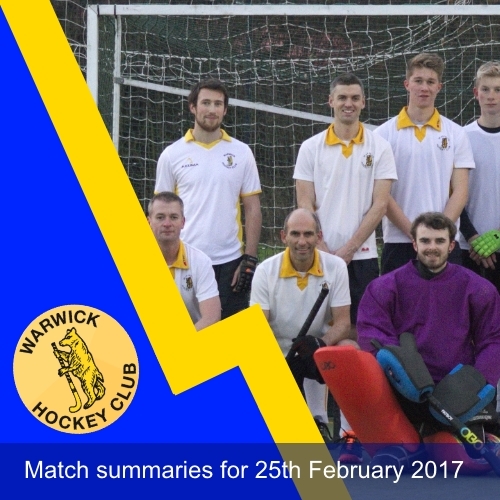 Claudio writes "5th team report.. playing against Northampton 4ths(Daventry) and the champions elect was always going to be tough.For 20 minutes Warwick controlled the match but unfortunately their big time players slowly took over and the 5ths conceded 4 goals. In a frustrating match that saw Cardellino get a rare card ( tackling Bobby Moore style) and some robust tackling overlooked the 5ths came away dejected but not enough to miss out on beer and food at their local pub ..2 matches left and the relegation fight is going to the wire". A terrific 2-2 draw against 3rd in the table for our Ladies. 2nd bottom but fighting hard with 4 games to go! Will Walker and his Dad are proud owners of a combine harvester. Will is very happy to tell you all about it. Proper big boy toy!